Here are some brief recordings of the sound of neurons. 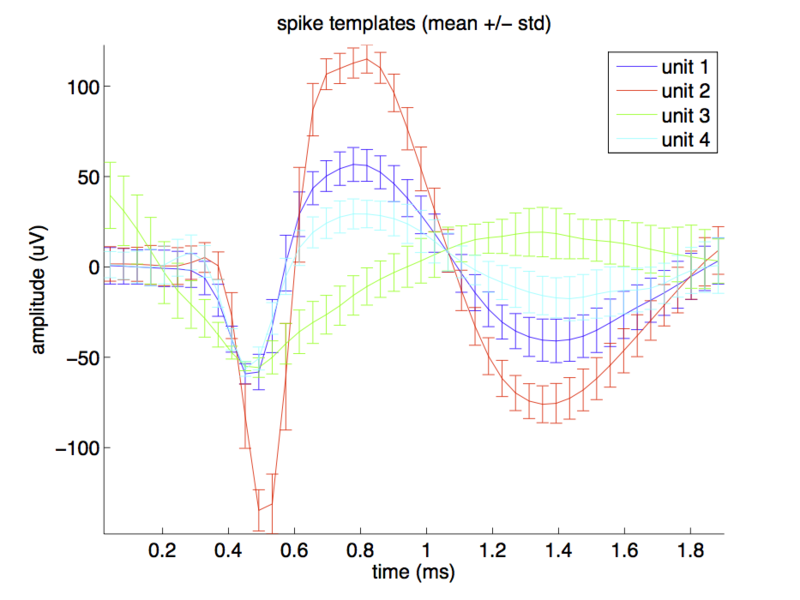 Action potentials are an electrical signal and can be replayed as sound. 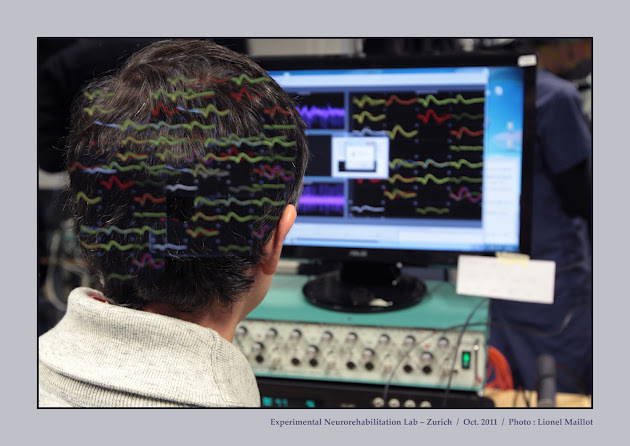 Experts can hear the differences between multiple units (neurons) recorded by the same electrode. Below, I created frequency-shifted version (like an old NES game) of a raw recording, where each neuron has a unique tone. The activity of these neurons occurred during initiation and continuation of bipedal locomotion. The modification highlights neuron interactions. Can you hear when the brain says go? Synergistic adaptation toward control is an artificial intelligence (e.g. neural network) and a user learning together to solve problems. This co-adaptation increases overall control capabilities for new environments and/or changing control signals. Specifically, the artificial intelligence can adapt to assist more or less based on the user’s current needs and abilities. Unfortunately this is no free lunch – the costs of co-adaptation include increased system complexity and potential instability – both intelligences must share common goals to develop learning synergies. 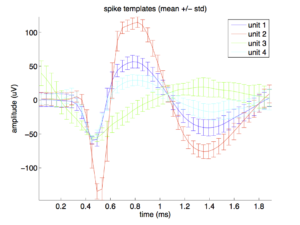 We’ve shown this control architecture for online robot control using neural states. 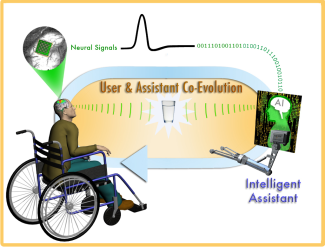 However, the architecture has implications for multiple other neuroprosthetic configurations. The CLONS project is developing suitable technological solutions to increase the quality of life of people affected by vestibular disorders. Specifically, an innovative closed-loop sensory neural prosthesis has been developed for testing in animal models. Furthermore, these technologies are currently being implemented in the clinic (by the teams at University Hospital of Geneva and Maastricht University). This prosthesis partially restores vestibular information by electrically stimulating nerves connected to the semicircular canals. The stimulation patterns are based on information provided by inertial sensors of the user’s head rotations. There are exciting research areas in this field in terms of stimulation parameters, efficiency, specificity, and changes over time. 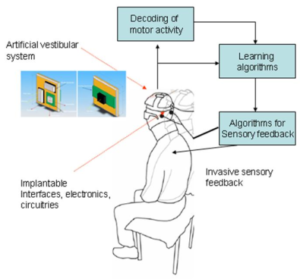 Brain-machine interfaces typically aim to replace an aspect of body function by connecting the user’s nervous system with external prosthetics. The NEUWalk Project is pursuing brain-spinal interfaces that restore body function by providing a new pathway between the brain and spinal cord which bypasses an injury site. This strategy will exploit existing, functional spinal circuitry and also provide physiological benefits for the patient. 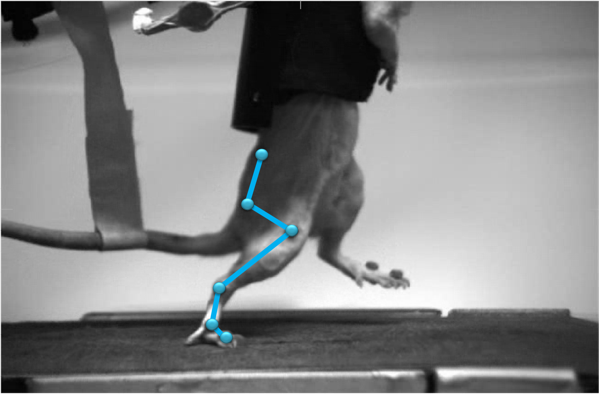 Recent spinal cord injury therapy breakthroughs using a novel, multi-pronged neurorehabilation approach showed that rats with completely paralyzing spinal cord injury can walk again after a combination of traditional physical therapy, pharmacology, and epidural electrical stimulation. We aim to integrate a BSI with neurorehabilitation to facilitate patients gaining voluntary control of therapy and eventually locomotion.